Alternative names: Koare, kōpūpūngāwhā, both originating in Aotearoa; kārito, from Proto Polynesian rito "unexpanded leaf shoot, sprout of plant with sheaving leaves" . 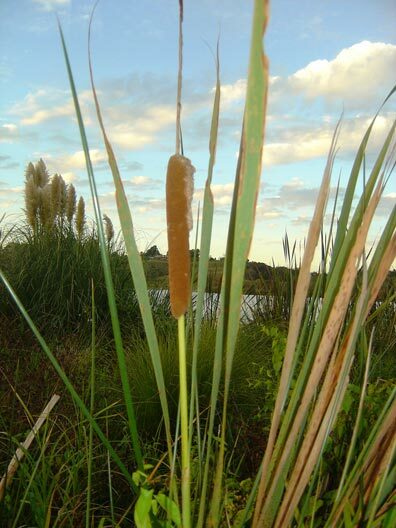 From Proto Tahitic *Raupo "a bulrush". 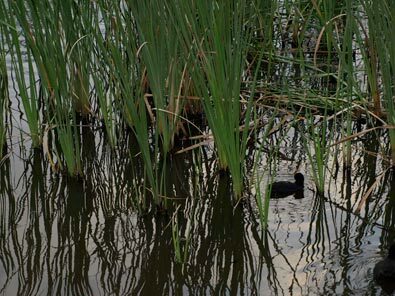 Kōpūngāwhā is also an alternative name for the sedge Schoenoplectus tabernaemontani (Cyperaceae), kutakuta, which is often found in the outer margin of lakes where raupo occupies the inner margin. Raupō taranga is a plant with sheaving foliage and a spectacular inflorescence, which grows naturally only on a few islands off the Taitokerau coast. Watch this space! This page is still very much under construction. However, it contains the essential linguistic and botanical information, to which both text and possibly more pictures will be added progressively as soon as time permits. See the "News" for February 2016 for more information. The raupō is the dominant plant along the margins of lakes and rivers, often developing extensive colonies in swamps and shallow waterways. 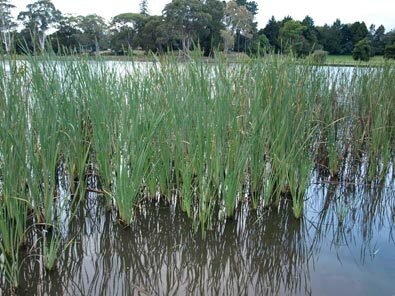 They can grow in swampy ground and in up to about a depth of a metre of water. The leaves are up to two metres long from where they emerge above water, and 2-3 cm across. 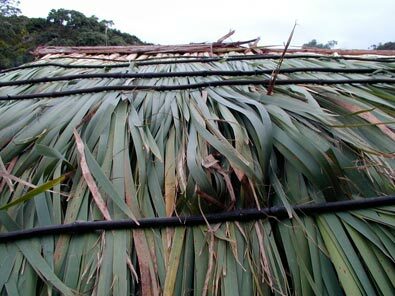 The sheathing, strap-like leaves were used for thatching temporary dwellings, and also for making sails and kites. The centre of the root and young shoots can be eaten cooked or raw; they were also pounded and dried for later use. The roots were said to have aphrodisiac properties, especially effective with young women. 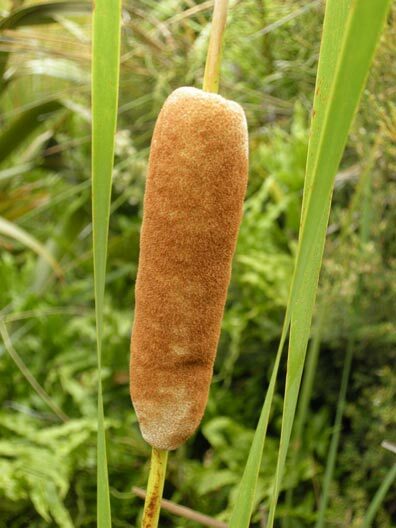 A sweet porridge (rerepe) or bread (pungapunga or tāhuna) can be made from the pollen, but the collection of pollen, best done around sunrise, is very labour intensive, and in the days when this was a more regular feature of Māori cuisine required most of the village to take part in the harvest. Murdoch Riley mentions a special dish prepared from mashing the kerewai beetle (Pyronota festiva, also known as the manuka beetle or reporepowai) with raupō pollen, and cooking the mixture in flax baskets in the hāngi. Kōreirei, kōareare, "roots of the raupō" (probably local origin, but cf. Proto Polynesian *qufi-lei, "yam species (Dioscorea esculenta); West Futuna Rei "sweet yam"). Hune (with variants Tāhune, Tāhuna, Tāhunga). The mini-parachutes (pappus) attached to the seeds of the raupō, chocolate-brown as the seed-head dries, from Proto-Polynesian *fune "downy core of breadfruit". The full etymology of this word will be found in the page for PPn *kulu "breadfruit"
Piaka, akakōareare, kōareare, kōreirei, kōuka, "edible rhizome; root of the raupō " (local terms, but the first two incorporate the Maori word aka, "root", derived from Proto-Austronesian *wakaR through Proto-Polynesian *aka, also meaning "root". Pungapunga, "pumice", "raupo pollen", "yellow" -- cf. punga "kōwhai when flowers begin to fade", also pungarehu "dust", "raupo pollen", from Proto-Polynesian *Punga "coral rock" + *Nehu (see above) . Kārito, kōrito, "young unexpanded shoots of raupō" -- from Proto Polynesian *lito "unexpanded leaf shoot": Hawaiian liko "leaf bud"; Maori rito "centre shoot, heart of tī and harakeke; Rarotongan rito "heart of plant"; Tongan lito "tender sprout". Tō, "stalk of raupo", from Proto Polynesian *tō "sugar cane": Tongan, Samoan, Rarotongan, Tahitian, Marquesan tō, Hawaiian kō, all meaning "sugar cane". References and further reading: See linked pages, Murdoch Riley's Herbal, and general works on NZ plants in the bibliography. The NZ Plant Conservation Network also has a page devoted to raupō . There is an account of a modern project to use raupō in building on the designTRIBE web site. Landcare research have issued an information sheet about weaving with raupō. Photographs: Raupō in Lake Rotoroa, R.B. ; flower heads John Sawyer and Wayne Bennett (c) NZPCN; the photographs of the model raupō whare in Whangaruru are from the designTRIBE web site (link above); the picture of the early 20th-century raupō whare is held in the NZ National Library collection. (Above) Detail of roofing on model raupo whare, Whangaruru. 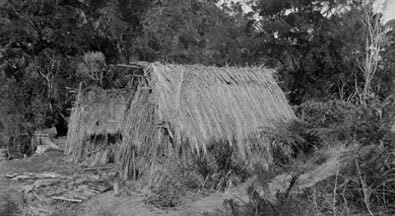 (Bottom right) Whare raupō in the bush, c. 1910 (location unknown).